It's a beautiful pattern, and though not many folks fish winged wets theese days. I bet it would be a great searching pattern, swung down and across , and a very good imitation of emerging and diving caddis. And it works real well on wild brook strout back east, so it would probably be a good bet for your cuts too. And fun to fish with such a tradition behind it. that looks differnt then the one i have. 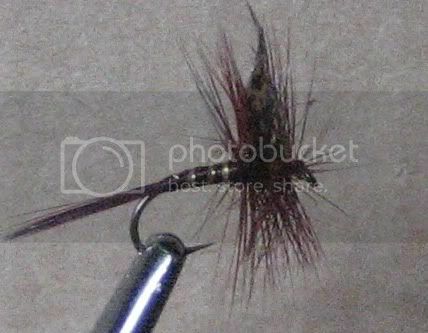 Yours must be a dry fly version with that stiff hackle collar. There are a lot of versions out there, the ones I'm familiar with are wet flies with a claret wine red body and a sparse soft, webby collar of hen hackle and hen fibers for the tail rather than the good quality dry fly rooster hackle and stiff tail of dry fly hackle on yours. it should be good in fast water as a general attractor- searching pattern or for imitating dark may flies that might be hatching, and a great prospecting fly for small mountain streams. I have tied the Dark Montreal. It is a wet fly that looks nothing like life'saflyin's picture. Canada had a series of postal stamps with flies. One of them was the Dark Montreal. It has a red tail tied on of a section of red goose shoulder. A gold tinsel tag, red floss body with a flat gold tinsel rib. The wing is two strips of turkey wing tied together faired out. it also has a red hackel throat. Peregrines photo in his link is much closer except the tail should be a feather strip like the wings. I did a little looking around in my giant pile of old magazines. It ( the Dark Montreal ) is on the cover of the spring 2006 Fly Tyer magazine. The picture of the stamp plus the fly recipe is on page 41. They say to use a strip of red duck wing for the tail, not goose shoulder. I think it is a beautiful fly. I have not any idea what the dry fly picture is but my curiosity is up so I will look around. If I find out I'll let you know. Talk about a coincidence! I just got the new issue of Fly Tyer in the mail today and they have the dark montreal on page 52. This is one of the fly patterns of a guy named Ray Bergman. They have some really great classic patterns in the article like the Parmchene Belle, Silver Doctor, and the Holberton. All married wing wet flies. All with the recipes. Great flies. I know that this is an old thread but I just couldn't resist talking about the Dark Montreal. Yes....it's a great fly and brook trout find it irresistible. However, do not use red but use the colour called "claret" which is a wine colour....a deeper colour than red. I also use this colour when making Royal Coachman dry flies. I may even tie a few dry flies that are similar to the Blue Wing Olive or even a caddis imitation but use claret for the body colour. I was going to say that I was under the impression that there were two versions of the montreal, a dark and light version. The dark being tied with turkey tail wing, dark wine hackle throat, dark wine floss body, and dark wine hackle or turkey tail, tail and a gold tinsel wrap. A very striking fly when thoroughly tied. The lighter one used reddish floss and hackles and the tail and wing were a lighter almost a ginger and cinnamon look. Love this fly. I started the brookie season with this fly in a number 12 and 14 and found it very productive in both colors. It has taken most of the fish so far this season . Can't wait for the Mayfly to hatch which seems to be a couple of weeks later this year, but until then, the Dark Montreal works for me. End Antism now! or Junk patterns? Simple way to tie hopper legs?